Before I got my bike I decided that I would need a better saddle. My rather large derrière would not get the required support from the standard saddle. I decided to get one that would not look out of place on the bike so I went for the largest MTB style saddle I could get with the bike through the cycle to work scheme. I decided on a 175mm Specialized Sonoma Gel saddle (the original was 143mm). As soon as I got my bike I bought some replacement parts for it. First were the grips. I decided on a pair of Specialized BG Comfort Locking Grips. I found these cheapest at Evans Cycles for £11.99 delivered. I'd already tried them out on a Specialized Sirrus Elite and liked the feel. I've not fitted them yet though as I'm still undecided on which bar ends to get and correct fitting will depend on the bar end size. The other item I replaced was the quick release seat post clamp. I don't know why most bikes have QR clamps as you would rarely want to adjust the height of the seat post. 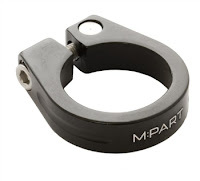 I decided to get an M:Part one in black from Chain Reaction Cycles for only £4.99. I didn't reaslise you could get these in different sizes so had to measure the bike first. My bike takes a 34.9mm one. As you can imagine it's a very easy item to fit.